Nintendo NES Cart. published 34 years ago by Nintendo of America, Inc.
Wild Gunman © 1985 Nintendo. Export release. Game developed in Japan. For more information about the game itself, please see the original Japanese release entry; "Wild Gunman [Model HVC-WG]". 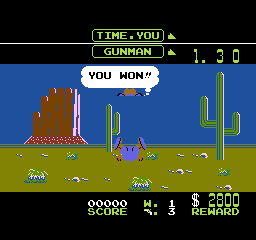 Wild Gunman for NES was released in October 1985 in North America.